Happy birthday to Dianne Foster! While World Audio Drama Day is over, Halloween is almost here, and with it, the birthday of Dianne Foster, who began her career on the Canadian Broadcast Corporation (CBC) during WWII, as a teenage actress in audio dramas. She was enterprising enough to create a local radio show for teens, which she wrote and produced, in her hometown of Edmonton. While today she is probably best remembered for her roles in noirish westerns, such as Night Passage, and the flat out noir, Drive a Crooked Road, radio was where it all began. She was once married to Andrew Allan, the head of national radio drama at the CBC, starring in his “Stage 50” productions, as well as the lead “Helen Manning” on “Brave Voyage,” a soap. 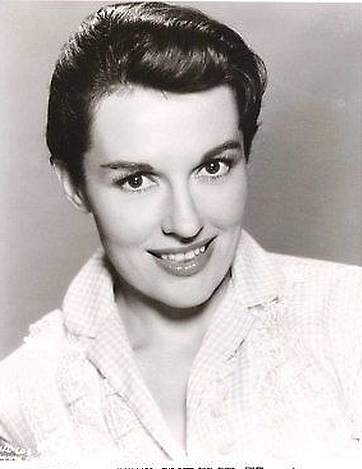 She was later married to, and divorced from, writer Joel Murcott, who had been radio editor for The Hollywood Reporter, and wrote for “Suspense,” and several other shows, including the pioneering “Defense Attorney” (alternately “The Defense Rests”) for Mercedes McCambridge. There’s an Orson Welles connection as well – after working with Welles in radio, he went on to give her a huge break in the “thea-tah”. In late 1951 Welles helped cast her in Olivier’s version of Othello for the London stage, where she had the opportunity to act with Welles and Peter Finch. There’s a fascinating story here from Macleans, March 1, 1950, about Foster and other young thespians working in Toronto’s radio scene.